We’d love your help. 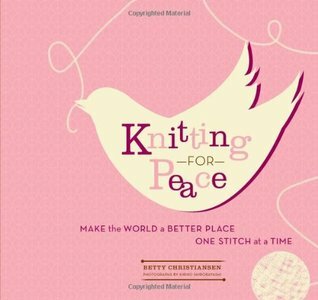 Let us know what’s wrong with this preview of Knitting for Peace by Betty Christiansen. All across the world, people are knitting for peace. They call the work they do charity knitting. This work tells the stories of 28 knitting-for-peace endeavours, with smaller, more anecdotal stories shared in corresponding sidebars. It also offers practicial, hands-on information, including 15 patterns for easy-to-knit charity projects. To ask other readers questions about Knitting for Peace, please sign up. Some really good things in here but I simply cannot get excited about anything supporting war, and despite the title I felt that there was a little too much American patriotism going on for me to fully enjoy reading. Still, some fantastic ideas and causes. I've looked through this book quite a few times at bookstores, but never wanted to shell out the cash for it. So when I found it at the library, I finally picked it up and read it. It's a good read for someone who wants to knit or crochet (though it only has patterns for knitting) for a charitable cause, but isn't sure which organization best suits their abilities and desires. I found two groups that really tugged at me. The Mother Bear Project, which is "is dedicated to providing comfort and ho I've looked through this book quite a few times at bookstores, but never wanted to shell out the cash for it. So when I found it at the library, I finally picked it up and read it. It's a good read for someone who wants to knit or crochet (though it only has patterns for knitting) for a charitable cause, but isn't sure which organization best suits their abilities and desires. I found two groups that really tugged at me. The Mother Bear Project, which is "is dedicated to providing comfort and hope to children affected by HIV/AIDS in emerging nations." The book made it seem like they only accepted knitted bears, but apparently the crochet pattern is available on their website for a $5 donation. Secondly, Project Linus, which makes it their mission to "provide love, a sense of security, warmth and comfort to children who are seriously ill, traumatized, or otherwise in need through the gifts of new, handmade blankets and afghans, lovingly created by volunteer 'blanketeers. '” I'm really excited that there is a chapter local to me, with blankets donated to the local hospital and other facilities. Why is it, I wonder, that I leaned more towards the charities that provide comfort, rather than warmth? What an inspiring book. After reading it I wanted to contact every knitter I knew to start a charity project. The book gives you the background of the various knitting charities in the US, including stories of people who have benefited from the work. There are lots of projects too and all of them are simple, meaning a new knitter could take them on. Compiled by a social worker, the patterns are from various charity organizations and have been well tested. You can add intarsia if you want a picture, or find a yarn of similar guage that is incredible to liven up something that is plain. The bottome line: These patterns work. You will also be inspired by the many different groups doing good for others. I like the patterns in this book, it's what got me started on Mother Bear knitting/crocheting. The stories are fascinating as well. My one problem with the book is that some of the choices in the book design do not make sense. Page backgrounds of pastel colors with white lettering make it hard to read in anything but the best light. Other than that, I like this book. This book has a lot of good basic knitting patterns: baby blankets, hats, teddy bears, etc. I enjoyed the stories behind some of the charities I've read about in various knitting magazines. If you find yourself wanting to knit, but needing a recipient, this book fits the bill. Reading this book gave me the idea to knit something for everyone on my holiday list and donate it in their name to an appropriate charity. Just reading it makes you feel good about yourself. Very interesting. Lots of ideas for where to donated knitted items. Also includes a history of knitting for the troops dating back to the Revolutionary War and still on going. If you love to knit, and you and your family have enough scarves and afghans, consider knitting for peace. Donations can be made for troops, nurseries, cancer wards, nursing homes and the homeless. Although this book is a little dated by some of the topics it discusses, the needs haven't changed. There are still eats and poverty, and illnesses, and we will knit on. Like to knit? Want a reason to knit more? What to make, for who and where - including clear instructions and photographs of the finished projects. Not hard, not intimidating. Inspirational and provides a variety of charities to donate whatever you want to knit. A very inspiring read. I have always been interested in "crafting for a cause" and this book is full of ideas and resources for finding ways to help others through knitting. This book serves the double purpose of action and information. If you are looking to do some knitting work for a charity this book will give you a variety of options to choose which suits your need. This book supplies you with patterns and instructions for knitted donations as well as hooking you up with a website and contact information. It's also just a great read if you are looking for an uplifting look at how people are helping others through knitting, now and in the past. There is always th This book serves the double purpose of action and information. If you are looking to do some knitting work for a charity this book will give you a variety of options to choose which suits your need. This book supplies you with patterns and instructions for knitted donations as well as hooking you up with a website and contact information. It's also just a great read if you are looking for an uplifting look at how people are helping others through knitting, now and in the past. There is always the danger of being outdated quickly in print form (since charities come and go), but I just went through all the charities listed, looking to "like" them on Facebook. While not every charity had a Facebook Page, I was only able to find one charity from the book that didn't look like it was operating any more -- and I certainly don't regret reading the touching tale. I’ve been wanting this book all summer, but only got around to ordering it right before I went to Europe, and it was waiting for me when I got home. I read it quickly and found it very inspiring; there were a lot of charities listed that I would love to knit for. My few complaints are that I would have liked to see more basic patterns, for novice knitters, since I will be working on converting others to our knitting club. Also, some of the stories felt a bit repetative, which probably just goes I’ve been wanting this book all summer, but only got around to ordering it right before I went to Europe, and it was waiting for me when I got home. this book was heartbreaking, hopeful, and inspiring. the patterns are basic, so the items in this book probably aren't things i could get excited about wearing or making for my own use. however, what they lack in aesthetic quality, they more than make up for in usefulness and love. my new goal is to make at least one of each thing in this book to send to the charities that need them. i would also love to start a group for people interested in helping in this way. this book was truly inspiring. I cried a little. It's a nice overview of different charities you can knit for (especially if you live in the midwest, there are familiar places mentioned), but it's not a book that you MUST HAVE. I was happy to get it from the library. It definitely could have benefited from more pictures, particularly of the pieces where there are patterns and each charity being highlighted could have used a visual. Interesting, fast read. This was not what I was expecting it to be (I freely admit I rarely read book jackets or blurbs)but I thoroughly enjoyed it. I was expecting just another knitting pattern book but was greatly surprised by the history of knitting and the different organizations new and old who knit for the good of others. Most of the things in this book I never knew about and was enthused to look up more information about the many organizations and projects. Good Job. This book made me cry, and that's probably the only time I've ever said that about a craft book. Such an elegant little book full of stories about how knitting and sending things off to people around the world can make life better for everybody. Lots of great personal stories interspersed throughout (that's why got me crying), and some good patterns to knit for particular organizations. A really wonderful idea, and a great book. It is so difficult to find an adaptable mitten pattern that can transfer between adult and toddler. This book had one, so I checked it out of the library. Not only does it have that mitten pattern, it has other projects that the author recommends for charity knitting, as well as contact information for various charities that accept finished hand knit projects. I liked this book so much I bought it! I love the concept of this book, the anecdotes, and the information on different organizations you can knit for. But none of the projects really jumped out at me. I know, I know ... it's not like knitting sensible things that people need is going to be really flashy. But flashy isn't even what I am looking for. It should still be fun. I found most of the projects to be awkward. Maybe once I have more experience I can come back to this and try one of the projects ... like the swirl hat. Items to knit for various charities. From cancer patients, to premies, to homeless animals, foster children, people victimized by disasters of every stripe, there is a project to make and a list of organizations with which to get involved. I've finished reading the introductory information and plan to make several of the project items, especially the snuggle for animal shelter inhabitants. Thanks Nicole for this recommendation. I enjoyed reading the historical aspects of knitting for a cause and finding out about all the various organizations that currently exist. I may just give knitting another try. Maybe knitting for someone else will make it more enjoyable for me, give my knitting some meaning. It's what initially got me into quilting. 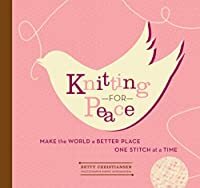 I ended up not being in the mood to really read this, but it was full of interesting facts and information about different ways in which knitting can be done for peace. This isn't just about peace during war times, but peace within our communities. A great resource! I really like the concepts in this book. It includes several good patterns and information about organizations devoted to knitting for others. I'm milling around in my mind just how I would like to become a participant in one of these knitting organizations. This book is a good resource for small project ideas. It also provides a vetted list of organizations that matches people and animals that benefit from your knitting. If you are a compulsive knitter like me, it is worth a look.